Splitboarding is all about lightweight, bomber gear that's built for powerful descents without weighing you down too much on the weigh up. 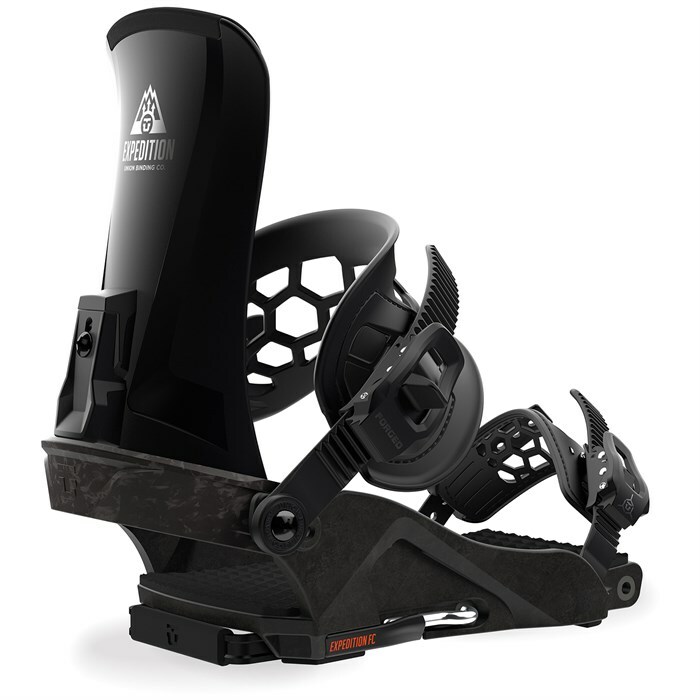 The Union Expedition FC Splitboard Bindings, featuring high-end Forged Carbon for the ultimate in split binding responsiveness in a light and durable package live up to those expectations in spades. With touring-specific Duraflex highbacks, a carbon X-Carb SP1 base and Union s pin split system, you can expect the comfort, power, and ease of use you're used to from Union with the tourability and lighter weight you want from a split binding. Splitboard with Union s finest kit on the Union Expedition FC Snowboard Bindings. Split Pin System  By combining the standard pin system with the Split System baseplate, Union increases the amount of connection between board and binding. Just one pin changes the mode and locks it into place. Touring Mode  For touring, the binding slides into the climbing cradle and is locked into place with the pin. Riding Mode  For riding, the binding slides onto the baseplate which rotates over the center of the board. The pin slides the through the middle of the baseplate for maximum connection. X-Carb SP1 Base  This revolutionary composite contains a very high amount of pre-blended, blended carbon, resulting in a super light torsionally rigid baseplate, ideal for splitboarding. Synthetic EVA 3.0 Bushings  Shock absorbing synthetic bushings are durable and an outstanding compliment for the smooth, natural ride of the SP1 base. New for 18/19 is the application of Non-Stick™ coating to Union EVA dampening systems. Gone are the days of getting ice buildup on your footbeds and highbacks. Forged Carbon Heelcup  The rigidity and strength of FC Heelcups act like a roll cage on a race car - stiffening the entire chassis. The male/female connection with the base provides a seamless response. Hex Ankle Straps  Seamlessly conforming around your boot, the new Hex Ankle Straps are incredibly responsive and durable. Found on the Expedition FC and FC bindings. Hexgrip Toe Straps  Multi-positional options and thermoplastic anti-slip material keeps you locked in and on point. Each version has differing amounts of material based on weight. Magnesium 3.0  The evolution of Union's proven bombproof ratchet system, the Magnesium 3.0 is a lighter and more sleek upgrade. Symmetric Duraflex Highback  Designed specifically for touring, Expedition Highbacks feature an adjustable quick-snap forward lean adjuster that goes from tour to riding mode with the flick of your fingers. Quiver Compliant  If you have a quiver of decks (split and non-split) just mount the Union Split System disc on each one. You can swap the Expedition bindings between each board quickly and efficiently. Split Disk  Compatible with Voile pattern and 4x2 DIY. Quick FLAD and Ladder  When it's time to switch your bindings to climb mode, the most comfortable option is lowering your forward lean adjuster to decrease the highback angle for the ascent. Featuring just a one-turn adjuster and quick flip ladder these changes happen with minimal effort.